Best Time to Visit: Dalhousie is a year round destination and has something to offer in every season. With plunging green trees and pine valleys surrounding it, St. Patrick's Church is another cool place which was left behind by the British. 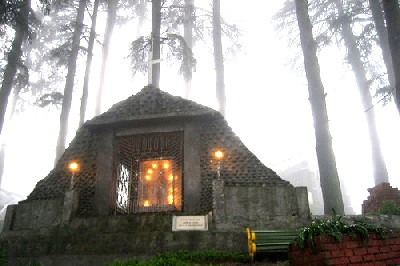 The old world charm of the place would infect the tourist on their trip to St. Patrick's Church which is located in the flourishing landscapes of Dalhousie. Located in the prehistoric Cantonment area of Dalhousie, the chapel is created by the officers and ranks of the British Army in 1909. The church is located within a 2 km radius of the main bus stand on military hospital road. St. Patrick's Church is the largest church in Dalhousie which can host approximately 300 people for Sunday prayer. The church stands out for its impressive buildings and the huge main hall. Like other churches of Dalhousie, the St. Patrick's Church is also controlled and maintained by the Catholic Diocese of Jalandhar. The church is deemed to be one of the most beautiful churches in North India. It has been more than a century since the church was built, but it still holds that magnetism and charisma of yore which attract tourist from all over India.